In World State Nicholas Hagger followed Truman, Einstein, Churchill, Eisenhower, Gandhi, Russell, J.F. Kennedy and Gorbachev in calling for a democratic, partly-federal World State with sufficient authority to abolish war, enforce disarmament, combat famine, disease and poverty, and solve the world’s financial and environmental problems. Its lower house, a World Parliamentary Assembly, would initially be based in the UN General Assembly and eventually replace the UN. 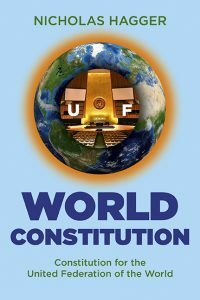 In this companion volume, World Constitution, he sets out a Constitution for a United Federation of the World (UF). In 14 chapters and 145 Articles he details the UF’s structure and institutions at inter-national and supranational levels, and the rights and freedoms world citizens would be guaranteed. He lists the 26 precedents and 204 existing constitutions he consulted (including the UN Charter and the US and EU constitutional documents) and the sources on which the Articles are based (including page references to his own works). This comprehensive and authoritative Constitution sets out with great clarity and concision how the whole world can be governed, and can be laid before the UN General Assembly. As a blueprint for a World State that can bring universal peace and prosperity it may come to be regarded as one of the most remarkable feats of statecraft of our time. NICHOLAS HAGGER is the author of 47 books that include works within history, philosophy, literature — and international politics and statecraft. He is a Renaissance man at home in many disciplines, including constitutional law. His archive of papers and manuscripts is held as a Special Collection in the Albert Sloman Library at the University of Essex. In 2016 he was awarded the Gusi Peace Prize for Literature.